"Careers aren’t built on successes; they’re built on the lessons you learn from your failures." 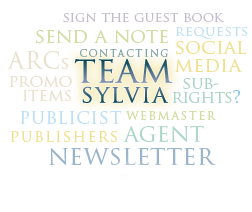 Sylvia's newsletter announces all new releases and other big news such as cover reveals. Twitter, Facebook, and More—oh my! The easiest (and quickest!) way to hear back from Sylvia is via her Facebook page and Twitter. If you clicked on a link from within this site and you came to a 404 error page, we would love to know which link has gone rogue. Please email Sylvia’s web team at alert@waxcreative.com and let them know what page you were on and where you were hoping to go. Thank you!